All membranes we use, are manufactured in our own membrane production. This way we can guarantee the highest quality standard and a very short delivery time. 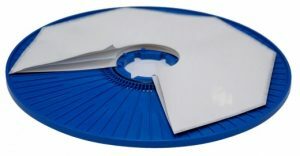 The membrane cushions are made of two single membrane discs with an intermediate layer (spacer). The membranes are manufactured from modified polyamide, the material of intermediate layer is polyester. Using the ultrasonic welding technique the medium can not come into contact with other materials (membrane glues, etc.). Beside various reverse osmosis (RO) membranes also nanofiltration (NF) membranes are deliverable.